Oregon’s housing finance agency presented an ambitious plan Monday to attack homelessness, while battle lines were being drawn over a bill that would open neighborhoods zoned for single-family houses to higher density dwellings. The bill would require cities and counties to allow duplexes and some higher-density housing in lands zoned for single-family dwellings. More than 100 people provided written testimony for a public hearing Monday, including the city council president of Sherwood, a residential community near Portland. Tim Rosener said the council opposes the measure because homebuilders will make decisions based on profit, not the needs of the communities. Sherwood already has the ninth highest population density in the state, and adding more housing means more students which will impact overcrowded schools, he said. But Todd Boyle, a 66-year-old retiree in Eugene, said the bill makes sense because there is land, like his, that could be developed further if not for zoning ordinances. He said the city won’t let him build a second home on his 6,900 square-foot lot that he wants to share with people who need it. “These lots were laid out 100 years ago in the days of horse and buggy,” Boyle said. The lots are too big for todays’ urban grown boundaries, sustainability or social justice, Boyle said. Under Oregon law, cities and towns have urban growth boundaries to control urban expansion onto farms and forests. But zoning within those boundaries has historically been handled by local governments, said House Speaker Tina Kotek, D-Portland. Kotek told reporters she expects “pushback” from cities. “This is new for the state to come in and look for additional allowances in residential areas,” she said before she testified on behalf of the bill in a Capitol hearing room. 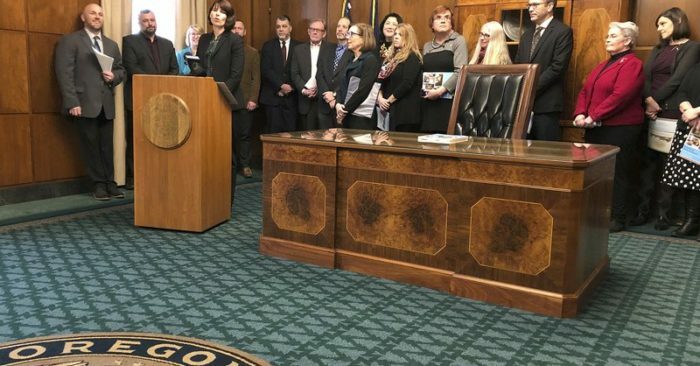 There is a pressing need to change the way Oregon operates, because 30,000 housing units must be built per year to meet the current deficit in housing and to build for the future as more people move to the state, Kotek said. “The reality is … we’re just not building enough housing and different types of housing, and if we’re going to grow as a state we need to change that,” Kotek said. On another front, Margaret Salazar, director of Oregon Housing and Community Services, said her agency’s statewide housing plan won’t come cheap. “Make no mistake, this plan is aspirational, and it will require resources,” Salazar told a joint press conference with Gov. Kate Brown. Brown, whose proposed budget would make a historic $400 million investment in housing, said the plan requires support from the Legislature for funding, and from philanthropy, business leaders, developers and builders. One of the goals of Oregon Housing and Community Services is to fund creation of 1,000 homes with support services for the poor. Priorities will be families with children and military veterans. “It is no mystery that we are experiencing a homelessness crisis throughout our state,” Salazar said. It has gotten to the stage where a town in southern Oregon will allow car camping for homeless people in church parking lots. The Medford City Council unanimously approved an ordinance Thursday allowing it as a step toward combating homelessness in the community, the Mail Tribune newspaper reported Monday. It is illegal to sleep in a vehicle overnight on the streets of Medford. Another town, Ashland, home to the Shakespeare Festival, is working to pass a similar ordinance.